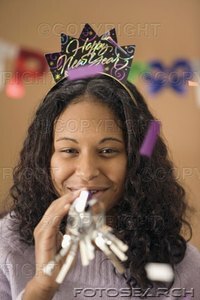 Between football games, parades and recovering from New Year's Eve, New Year's Day birthdays can slip through the cracks. Some restaurants and party rental sites are closed on January 1, since the bulk of their preparations occur on December 31. Despite these obstacles, making the day special can be fun and creative. Combine your New Year's Eve and birthday celebrations. This works best for teenagers and adults who expect to stay out until midnight or later. Have a New Year's themed party, but hold off on the cake and candles until midnight. Consider extending the party into a sleepover with a birthday brunch in the morning. Have a Rose Parade party. If you live in southern California or are looking for a vacation, volunteer as a Rose Parade worker. Float coordinators are always looking for help in the days before the parade and the atmosphere is fun and festive. Stay overnight and have your party while waiting for the parade to begin in the morning. Have a football party. Combine the birthday festivities with watching your favorite team. A commercial break in the televised game is the perfect time for party games. Consider having the party on a different day. For school-age, children holiday birthday parties can be difficult because many of their friends may be busy or out of town. Having the party the weekend after school starts may increase attendance. You can always have a small cake on January 1 to celebrate the day. Have a winter-themed party. If you are worried that the holiday will overshadow the birthday, focus your theme on winter. Have an ice-skating party, or plan the party somewhere guests can play in the snow. For school-age children a movie party, where the entire party goes to the movie theater, is a good distraction from the holiday. If the party is combined with New Year's Eve or New Year's Day festivities, make sure to single out the birthday boy. Let him wear a special hat or pin and sing "Happy Birthday." Make your plans ahead of time, as party rentals book up around New Year's Eve. How Do I Word Invitations for a Black-and-White Theme Party?